Charles Sharrock was born at Terang in 1894, a son of John Thomas Sharrock and Janet McMillan. The Sharrocks later moved to Fernleigh at Mount Napier. At the time of his enlistment, six foot tall Charles was working as a station hand at Gazette at nearby Penshurst. On 21 March 1916, a send off was held at Blackfellow’s Creek near Warrabkook for Charles and Frank Sartain of Gazette. Apologies were made for the people from Mt. Napier as they were fighting a bushfire. Charles arrived in England on 18 July 1916, and marched to Salisbury Plain for training. While there, his mother died in the Hamilton Hospital on 4 October. Charles left for France on 23 November. Charles’ service record shows the 10th Australian Field Ambulance transported him on 24 December to the 7th General Hospital, arriving on Christmas Day. Charles had contracted mumps and while in transit to hospital, he passed the time writing to his father. He wrote again on 5 January 1917 to say he was feeling better and enjoyed the clean sheets and nurses’ care after being knee-deep in mud. Charles was able to rejoin his unit on 17 January 1917. 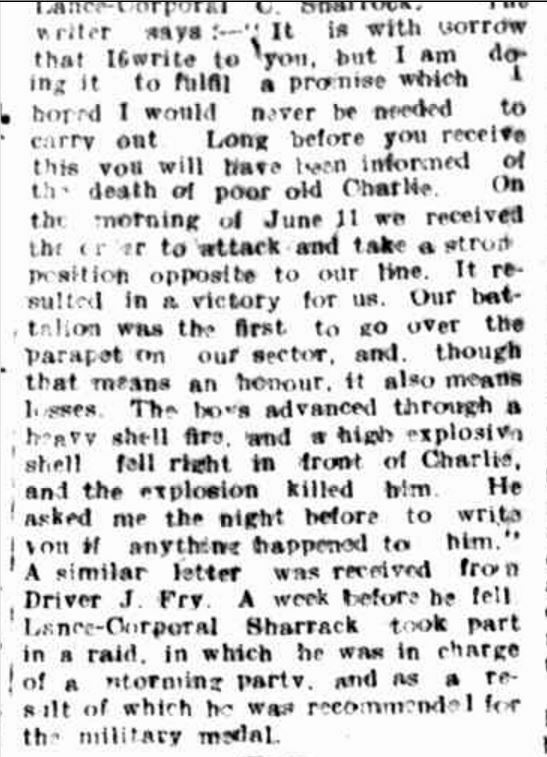 On 24 April, Charles was promoted to Lance Corporal and the news was published in the Hamilton Spectator on 2 July 1917. On 4 June 1917, Charles was in charge of a storming party, raiding enemy trenches, Charles’ actions later saw him highly commended by the Divisional Commander for gallantry and Charles was recommended for a Military Medal. On 8 June, while at Messines Ridge, Charles was killed in action. 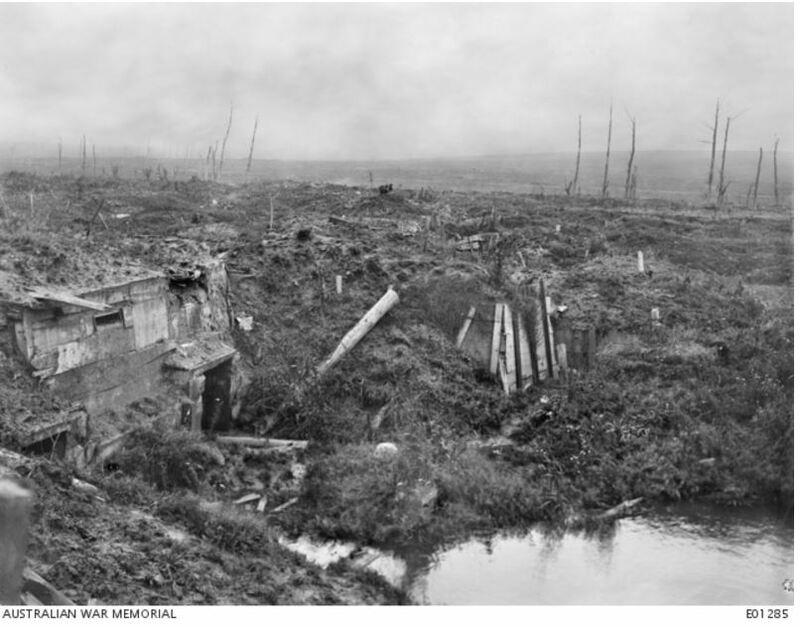 Witnesses saw a large piece of shell hit his cartridge pouch and explode while on the extreme right of Messines Ridge. Fellow battalion members remembered him as a fine fellow…one of the best. John Sharrock was informed of Charles’ death in early July just days after he received news of Charles’ promotion. Prior to his death, Charles had asked Private Reuben Basham to write to his mother if anything happened to him. Of course by that time, Janet Sharrock had died, probably unbeknownst to Reuben who upheld his promise to Charles. “THE LATE CORPORAL C. SHARROCK.” Hamilton Spectator (Vic. : 1870 – 1873; 1914 – 1918) 13 Aug 1917 <http://nla.gov.au/nla.news-article119855183&gt;. In August 1918, Charles’ sister Elizabeth Sharrock, a nurse at Hamilton Hospital, wrote to base records asking about a Military Medal and Distinguished Conduct Medal Charles was rumoured to have been awarded. There was no medals forthcoming. A tree was planted for Charles Sharrock along Hamilton’s Anzac Avenue. Charles father John Sharrock died in 1941.